Chuao Chocolatier is giving away a year’s supply of gourmet chocolate treats to one lucky winner and many other crave-worthy prizes every week. We’re calling it “For the Love of Chocolate” because, at Chuao, we believe everyone should be able to enjoy handcrafted, all-natural decadence. Don’t settle for boring, waxy chocolate. You deserve the very best, and we want to give it to you! To enter, simply like Chuao’s Facebook page where you can then enter the sweepstakes for a chance to win the year of free chocolate. Entries will be accepted from January 21 to February 28. One winner will be selected each week during the Sweepstakes to receive a set of three of Chuao’s favorite chocolate bars, and the Grand Prize Winner will receive a year’s supply of Chuao chocolates (sent in four shipments- one for each season of 2013). Which flavors sound best to you? 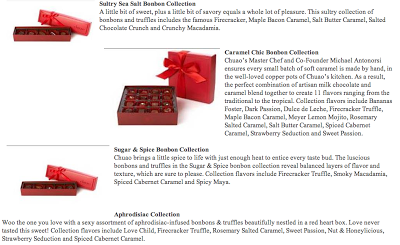 I love them all but I would say that I am MOST excited to try each one of the Sea Salt Collection and the Carmel Chic Bonbon Collection!!! i love that your name is maggie smith (downton abbey) i love that your pic is at the beach and i love chocolate! Oooooh, I would love to win this! Thanks for posting!